Handel’s Alcina, an opera seria originally produced in 1735 with considerable success, opened Thursday evening at the Boston Conservatory Theater for a four-performance run. After its final performance in Handel’s lifetime, in 1738, the work dozed until a German production was mounted 190 years later, whereupon it was largely overlooked again until Joan Sutherland was persuaded to take the title role for her debut at La Fenice in 1960. Her later recording put Alcina on the operatic map, and many leading sopranos have undertaken the role in the last half century. Even opera lovers who rarely see a Baroque opera are aware that these works consist largely of a string of da capo arias, each designed the express the momentary sentiments of a character, whether sung to another character or, as an aside, to the audience. The main point of the aria is expressed in its opening section, which focuses on a single emotional state. A contrasting section, often in a different key and even a different tempo and meter, furthers the argument, either by extension or contrast. At that point, the composer writes in the score “Da Capo” (from the top), and the first part is repeated, almost always with elaborate ornamentation. The gradual revival of Baroque music, flavored by an understanding of the significance of the richly ornamented repeated section (which allowed individual singers to expand on their characterizations, in addition to delighting the listeners with their vocal virtuosity) has gone a long way to reawakening the kind of pleasure 18th-century audiences took in this repertory. The score of Alcina is flush with varied arias in a longing, or lively, or angry, or tragic vein that offers several hours of varied musical satisfaction. Beyond that, the libretto—derived originally from Ariosto’s great 16th-century epic Orlando furioso—retells one of the (many!) fantastically romantic tales that the poet blends in this vast, colorful poem. Alcina and her sister Morgana are sorceresses who inhabit a magic island that appears to be lush and beautiful, with fields and plants, streams and hills. But it is in fact a desolate waste, a fact concealed by Alcina’s magic, which enchants the minds of any who visit. She makes amorous captives of the various heroes, but as soon as she tires of them, she turns them into beasts, trees, rocks, or even ocean waves. An audience in 1735 would have expected a stage picture filled with things to look at, arranged in deep perspective, suggesting Alcina’s sorcery in fooling the minds of her. For the production at the Boston Conservatory, director Nathan Troup conceived a more modern view—imagining the island when one sees past the magic charms (as everyone does by the end). The stage is presented as a nearly empty white box. The audience is not in Alcina’s thrall. Members of the company may enter and cross, or even appear and disappear like distant spirits behind a scrim that closes off the back of the stage. They are the earlier captives, who still exist in a state of transformation. This clean and effective set was designed by Julia Noulin-Mérat, with costumes by Lara De Bruijn, and lighting by Eric Watkins. In Ariosto’s poem, the hero Ruggiero plays a significant role throughout in pursuit of his love Bradamante. This Ruggiero is an ancestor of the Este dukes of Ferrara (who were Ariosto’s patrons), so naturally he is given a leading role. In Handel’s telling, Ruggiero has already landed on Alcina’s island and become smitten with Alcina—which has caused him to forget his fiancée Bradamante. During the proceedings, characters fall in and out of love (to the joy or despair of their opposite number). Ruggiero receives a ring from his former tutor (who as arrived with Bradamante) revealing to him the emptiness of Alcina’s realm. Eventually he destroys Alcina’s magic powers, all the enchanted captives are released from their magic bonds, the two pairs of lovers become properly assorted, a young boy who has been searching for his father (who had been turned into a tree), express their happiness, while Alcina is left desolate. Handel’s orchestra (conducted by Andrew Altenbach) is not a large one (strings, of course, plus oboes and bassoon; horns are used for just one aria, a theorbo is featured in another; harpsichord, and strings), but he uses it with a fine flair for variety, providing specific coloration for the mood of each aria. The seven principal singers on opening night (there is an alternate cast for the Friday and Sunday performances) all carried their parts very well. Mezzo-soprano Abigail Dock, in the castrato role of Ruggiero—by turns lovelorn and heroic—was exceptionally effective, in color and line and range of expression, whether in poignant lament or spectacular virtuosity. 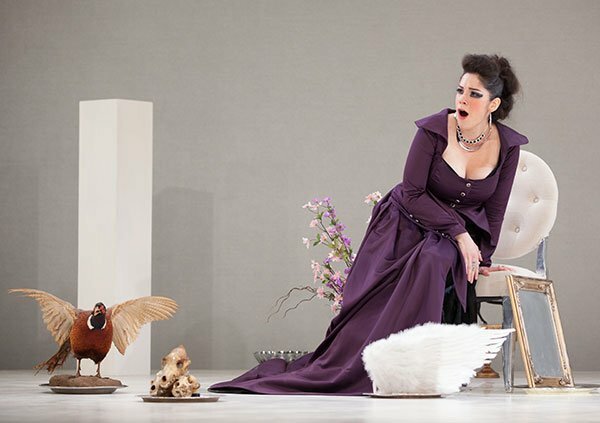 There is no question why coloratura sopranos should adore the role of Alcina; Isabelle Zeledón made the most of its scenery-chewing possibilities. Bradamante (Ann Fogler) and the old tutor Melisso (Simon Dyer) ably served as the dramatic and musical foils to Ruggiero. Morgana (Jennifer Soloway) and Oronte (Quinn Bernegger) were the “other” couple, blending a light soprano with a sturdy tenor. Brianna Meese was especially charming as the boy Oberto searching for his father, singing with a fresh youthful voice and acting with boyish charm. One of the biggest surprises of Alcina, given the general reputation of the genre for being slow-moving, is the fact that Handel brings a particularly strong close to each of the first two acts and then builds quite a head of steam in the final one, where the various threads of the plot are worked out, the lovers are properly reunited, the enchanted captives released, and Alcina gets her lyrical comeuppance. All in all, the BoCo musicians and crew have created a welcome production of one of Handel’s great dramatic works. Repeats Friday and Saturday, November 18 and 19, at 8pm, and Sunday afternoon at 2pm at the Boston Conservatory Theater, 31 Hemenway St.